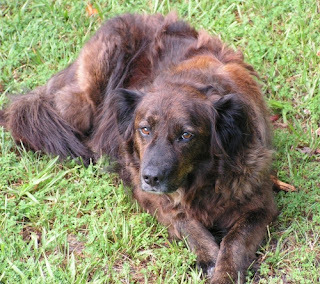 Padsworth, DragonDrop and Snoodles would like to let you know that the Padsworth Project is carried on in memory of our sweet rescue pup, Pepper, who walked across the Rainbow Bridge on November 13, 2012, at the ripe old age of thirteen. 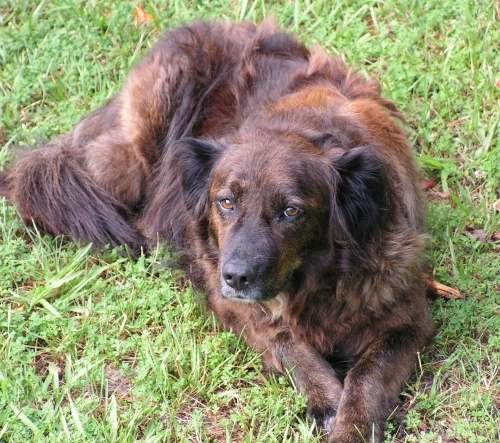 To honor her memory, and to help shelter and rescued animals everywhere, just . . .
Click on this link and you will find more of an explanation about how to participate. For each bed, pad, or blankie that you complete and donate to your local animal shelter, you will receive two entries in the prize drawing at the annual Pets on Quilts Show! Just post on your blog or Flickr page, and link up here! 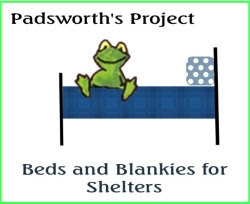 This is a wonderful charity project Padsworth. SewCalGal will definitely help with PR and to help make pet beds too. I hate to think of four legged kids living in shelters, having to sleep on metal cages or concrete floors. I firmly believe if they have a chance of sleeping in a comfy bed they'll better present themselves to prospective families that want to adopt them and ultimately have a better chance of finding a forever home. Count me in. I want to help. Great project. Oh! I love this! I don't have a blog, but I've been doing this for years! I call mine Table Scraps (heehee). I was inspired by The Snuggles Project--actually, I read about Snuggles and went out and bought a machine and fabric THAT DAY, about 12 years ago. I'm self taught and make quilts for auctions and raffles to benefit rescue groups as well...but my first love is the Table Scraps for the shelter. I'll be following your blog for sure now! Hi Jacob, I couldn't reply to your comment by email, since you were a no-reply blogger. Thank you for stopping by, and I hope you will join us and make some beds or blankies for the project! So happy that you are a fellow animal lover and are interested in helping out! Hugs! do you have any patterns or tutorials for making these dog beds/pad? Would love some get started help. What a wonderful idea! I love our furry friends! I would like to participate in the making of some beds, but am unable right now due to home construction project namely my sewing area. Hopefully it will be completed by sometime in the winter and I'd be happy to whip up a few beds for the animals. I've donated towels and unopened dog food for our local shelter several times and they are most appreciative. So if you can't sew, why not call your shelter and ask them what they need. We also have a consignment shop in our town that all the donations once they are sold the money goes to the Animal Shelter. I donate all my unwanted items to them rather than Goodwill or Salvation Army. Check with your local area to see if there are any of these places too! The animals in the shelters eyes tell their story and you can make it a happy one!! Bless you! I love this idea!!! We purchased a new mattress for our son and I thought that his old mattress could be repurposed for a dog bed!! Why throw something out that could be used for the animals at our local shelter?! As for the sheet... I used a crib sheet that I cut and sewed to size... it fits perfectly! I can't wait to bring the mini mattress and bed sheet to them!! I just linked one blankie that I got made for our local Humane Society - she has a tiny elderly chihuahua that the blankie is going to! I hope it will bring her some comfort and I pray for a forever home!!!! I will continue to make blankies in the future. Thank yall for bringing this need to our attention. Pepper is so sweet Jacque. We lost our Piper this year too. You never forget it once you love a dog like that. Your Padsworth Project is a wonderful memorial.